Rancho El Aribabi, a conservation ranch about 30 miles (45 minutes) south of New Mexico in the Mexican state of Sonora, is a popular spot to watch birds. The ranch is working with the Sky Alliance to help save the jaguar. Photos of the big cat have been taken on the ranch. Over 35 threatened or endangered species of plants and animals live on the ranch. You can help support it by coming to visit. They have facilities and guest rooms for up to 12. These whales seem to know that the people here are safe and seek out interactions with them, behavior biologist Toni Frohoff says. These whales cooperate with viewers and even enjoy the visit. The gray whales migrate to this area from January to March. Pachio's EcoTours works with Ranulfo Mayoral, the first fisherman to have an eerie, pleasant encounter with a gray whale. Antillean manatees live about 100km inland in the Catazajá wetlands, according to Tropical Conservation Science. The manatees are seen more often in the permanent lagoon area in the south west of the wetlands. Researchers are studying the endangered green sea turtle in San Ignacio Bay. Locals help in the effort, which gives them an income and reason to protect the turtles. Through See Turtles and Earthwatch, you can help, too. The one-week expedition is $2,500, not including air. Hammerhead sharks can be found all over the Sea of Cortez, off Baja California, according to Elasmo-Research. Club Cantamar hosts diving, kayaking and boating expeditions to see hammerheads and whale sharks. They also host the Shark Research Institute's field station. Juveniles are found close to shore and adults congregate during the day in undersea hills "seamounts" or "goyots". Tours leave from San Diego and Ensenada, Mexico to the area near Guadalupe Island, Baja, California, to swim with great white sharks. Quintana Roo has one of the biggest populations of manatees in Mexico, about 100, especially around Bahia de Chetumal, Laguna Guerrero and Rio Hondo, according to this CEP report. The Cancun region also has swim with manatee programs--highly unusual and unsavory for such an endangered species. The eco park in Xcaret has manatees in a tank, but says they were rescued. Belize is a tiny country with a relatively big manatee population--now that people have (mostly) stopped eating them. United Nations Environment Program says that the mangroves, swamps and rivers make this an ideal habitat. The Island of Fernando de Noronha 200 miles off Brazil is part of a national park and home to at least 8 species of shark, many dolphins and sea turtles. You can see them in boat or by diving. You're going to have a hard time seeing the endangered Amazonian manatee which likes remote, dark backwaters of the Amazon. The Peixe-boi (Fish Ox) is the smallest surviving manatee; it lives in freshwater, lacks flippernails and has a white tuxedo chest. Brazil's Mamirauá Reserve is where the manatees--known locally as or fish ox--stay during the rainy season, when the area is like a lake. In dry season, they move to the actual Lake Amanã. You can now see Pablo Escobar's controversial hippos on the Hacienda Nápolesestate where he once ruled the drug world about 100 miles from Medellin. Escobar built up quite a zoo along with a dinosaur park with life-size concrete models. After he was killed 20-something hippos roamed and reproduced.Once pair wandered off the grounds and the male was shot in 2009, amid hysteria about hippos spreading disease and impacting native species. Officials for now have agreed to let them go--for now. The Colombian government now owns Hacienda Nápoles and runs it as a kind of wildlife park and museum. They have plenty more species than hippos (horses, tapir, deer) and let you enjoy the dinosaur park, too. The Sloth Sanctuary raises baby sloths, which are frequently orphaned. The founders say sloths turn up here because they face " habitat loss, electrocution by power lines, traffic injuries and death, hunting, and even senseless violence." They treat and release sloths that can make it in the wild. Others serve as ambassadors to teach respect for sloths. You can tour, volunteer or stay in the small hotel. If you've seen an adorable sloth video, it's from here. You can see coatis lots of places in Costa Rica, but one of the easiest places is around the Arenal Volcano. 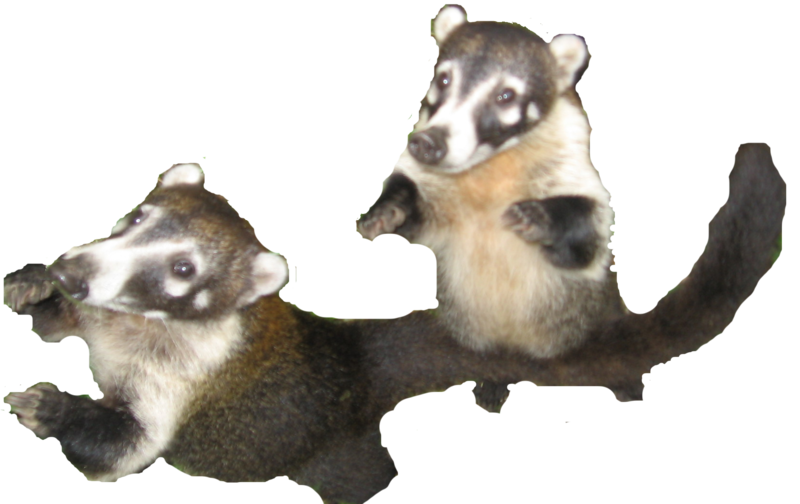 A cross between raccoons and hamburglers, the coati mundi is only too happy to come up and steal some food. Many around theArenal Observatory Lodge. Tortuguero National Park has Costa Rica's biggest manatee population, according to the UNEP. Though even here they are rare and diminishing. Schools of hammerhead sharks gather near Costa Rica's Cocos Island, a national park. The island, which also has red-footed boobies, is also a UNESCO World Heritage Site. The Galapagos Islands off Ecuador are the Mecca for wildlife watchers. The endangered Galapaogos fur seals and Galapagos sea lions are part of the reason: protected from hunting they let you get quite close. Bonus species: Endangered Galapagos Penguins, Giant tortoises, iguanas, flamingos, petrels, Flightless cormorants,Blue-footed Booby, albatross. Giant whale sharks show up on Utila from February to April. Responsible Travel recommends a weeklong $850-$1500 trip to help study these plankton eating sharks that grow up to 30 feet. The price is about the same for divers and non-divers. Puerto Rico is the only place in U.S. waters you might see Anitillean Manatee, which is the other subspecies of the West Indian Manatee. The ones in Florida are called, appropriately enough, the Florida Manatee. Not much difference--mainly where they live--but they are separate populations (for now). The manatees are benefitting from all those years people were kept off Vieqes (except for the bombers). You can get to Vieques by plane or ferry. Here's a map--watch out for ordnance in the closed areas. Mayaguez, Puerto Rico, gets manatees, especially around the Río Guanajibo, south of the city, near Punta Guanajibo, according to Boating Puerto Rico. Antillean Manatees live on the south part of the main island of Puerto Rico. La Parguera, a small fishing village, gets them. Check out the Parguera Natural Reserve and the canals. This town is also special because it has a bioluminescent bay. Nurse sharks come by the hundreds to French Cay in late summer to mate, so many you can see them in the shallows, says Scuba Safari. Along with the Florida Keys, it's one of only a handful of shark mating sites in the world. Even if you don't make the event, there are nurse and reef sharks yearround. Middle Caicos has plenty of sites where sharks are drawn by lobsters or discarded conch. The Miami Herald reported on night diving shark trips, in which sharks are obvious because their eyes glow green in light instead of the usual red. You don't have to go on a rough adventure to see them; even Club Med has diving tours. About one in six endangered leatherback females nests here in Trinidad. On some nights you may see as many as 150 of the biggest turtle on earth in April through July. Locals patrol the beaches to protect the turtles from poachers. If you go through See Turtles and Earthwatch, you can help patrol and weigh and measure the eggs.